The Pittsburgh Penguins have acquired forward Daniel Winnik from the Toronto Maple Leafs in exchange for Zach Sill, a 2015 fourth-round draft pick and a 2016 second-round draft pick, it was announced by general manager Jim Rutherford. 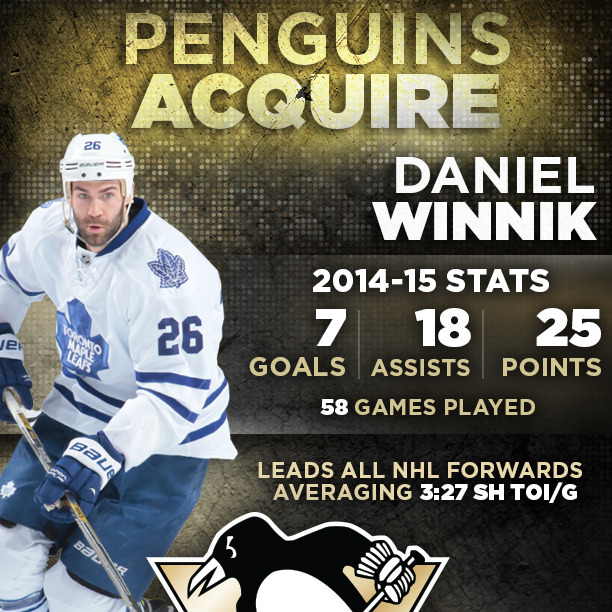 Winnik, 29, has seven goals and 25 points in 58 games with Toronto this year. He led the team with a plus-15, which will also place first among Pittsburgh forwards and second overall on the club. The 6-foot-2, 207-pound Winnik led all Toronto forwards with 50 blocked shots and ranked third with 99 hits this year. His 3:27 average shorthanded minutes per game is the highest total among all NHL forwards. A native of Toronto, Ontario, Winnik established career highs last season with Anaheim in points (30) and assists (24) in 76 games. Winnik has played in 548 career NHL games with Arizona, Colorado, San Jose, Anaheim and Toronto, totaling 175 points (56G-119A). He has also suited up for 28 career NHL playoff contests. Winnik played three years of college hockey at New Hampshire from 2003-06, surpassing the 40-point mark in each of his final two years. Winnik was originally drafted by the Arizona Coyotes in the ninth round (265th overall) of the 2004 NHL Draft. He will be an unrestricted free agent this summer.